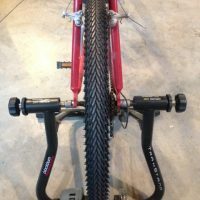 A few nights ago, I set up my trail bike on my wind trainer, a marvelous contraption that holds the bike’s back wheel and puts pressure on it, creating resistance. When I got up the next morning and saw that it was 17 degrees, I headed downstairs to ride in my cozy basement. Wind trainers are one of my favorite pieces of exercise equipment because I get to ride my own bike, instead of having a big, expensive stationary bicycle that takes up space all year long. You go through the gears just like you do outside, starting out slowly and easily, then shifting into higher gears as your muscles and joints warm up. The bonus of a wind trainer is that it folds up for summer storage, taking up a tiny amount of storage space compared to a stationary bicycle. They’re either called Wind Trainers or Bicycle Trainers. But there’s no getting around the fact that my trail bike has now turned into a cardio machine, which means B-O-R-I-N-G. The second I get on a treadmill or stationary bike, extreme boredom sets in—immediately. But if I distract myself by sitting upright and checking emails on my phone, reading or listening to books, or even making phone calls, it’s a great ride! (Your seat needs to be comfortable and a good fit to be sitting upright.) Believe me, I’d rather be biking out on the beautiful trails, but I love getting a great head start on my office work AND fitting my exercise in. I’m always amazed that I can still keep a good pace on the bike while doing all of this. How often do we skip exercise because of other pressing to-do tasks? I actually look forward to winter indoor bike riding because I can still get many of those things done while fitting in a nice aerobic workout. 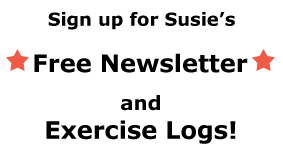 The trick is to collect reading materials and online work ahead of time. If you make it easy to hop on the bike, you’ll be more likely to get your exercise in. I always try to set up the bike and wind trainer next to a tall file cabinet or bookcase on one side and put my sturdy music stand on the other. Either side can hold my reading materials, phone, etc., but the music stand can be tilted and brought closer so that I don’t have to hold the papers. Sometimes, I’ve even placed a sturdy board between the bookshelf and a ladder for a jerry-rigged desk, bungee corded to hold it in place. Someday, I hope to make a more stable, custom made bike desk! Since biking isn’t considered weight bearing exercise (unless you’re standing up on the pedals—and that’s pretty precarious on the wind trainer), when I get off the bike, I’ll do some stomping and go up and down the stairs a few times to remind my bones to stay strong. If biking is your main aerobic exercise, be sure to include a good amount of on-your-feet time, too. Of course, twice weekly strength training is a must! 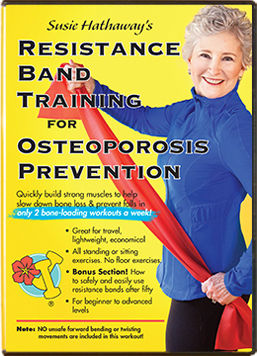 My DVDs, Safe Strength Training for Osteoporosis Prevention and Resistance Band Training for Osteoporosis Prevention are on sale—$5 off—for Black Friday weekend, starting on November 24th. 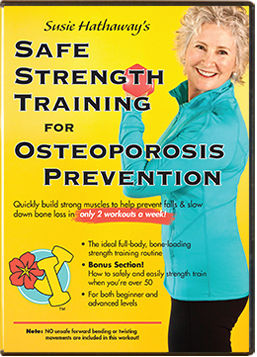 ← Osteoporosis Diagnosis & Lifetime Exerciser? Ironically I picked up a Schwinn exercise bike (practically new) for $10 and alternate with my Nordic track (15years!). I also do your resistance DVD for arms and abs every other day (approximately 16 months). Love it. I’m 63 and love exercising. Thank you for your encouragement. Best of health. Elaine, for $10 I would have picked up that Schwinn exercise bike, too! A good friend found one for $40 at a second-hand store and we thought that was a great bargain. You have quite the luck with your cardio machines…a 15-year-old Nordic track still running. I’m glad to hear you’re strength training with the bands to round out your exercise routine. Keep up the good work! It will serve you well for the rest of your life.